It’s finally feeling like summer ’round here. Not only does that mean sunshine for this vitamin D deprived gal but that also means lots of warm-weather running. I know I’m in the minority, but I’m a big fan of summer running. Aside from running and sunshine, summer also brings the opening of farmers markets and farm share — which means we get to eat all sorts of yummy, fresh-from-the-farm, food. If you’re new to farmers markets or CSA (farm-shares), it can be quite confusing, a little intimidating, and perhaps a little flustering at times. When I first joined my local CSA I was excited but when I picked up my first bag from the truck, I got home and began scratching my head. “What is that?” “How do I store this?” “I wonder how to cook this?” were all questions I had. It took a lot of digging and a bit of creativity, but I soon had a good handle on all the farm share had to offer. 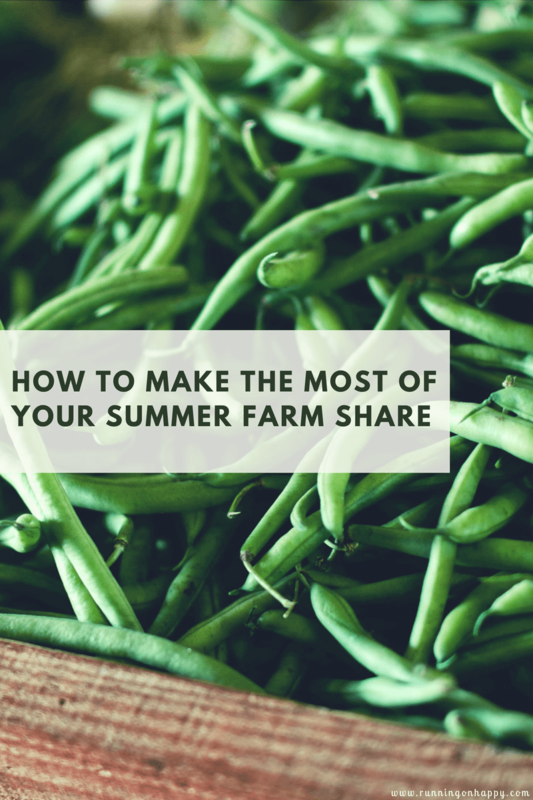 Today I’m going to give you a few tips to help you make the most of your summer farm share. After all, veggies shouldn’t be intimidating! 1. Find Out What’s in Your Bag. If you’re able to get a list of what will be available in your box or bag for the week, it’s a great place to start recipe research, meal planning, or even swapping with your friends and neighbors. If you can’t find out what’s in the bag beforehand, that’s okay. You’ll just have to rearrange the order of the tips below. Once you know what you’ll be getting in your bag, you can begin recipe research. The internet is a glorious place when it comes to learning new culinary skills or combinations. A lot of farm shares and farmers markets will even have recipe cards at their tables, or can give you serving suggestions. When I was first getting used to things like celeriac root, fennel bulbs, and dragon tongue beans, I searched for all sorts of recipes. It really helped me use all the items from the bag and very little went to waste! After you’ve researched some recipes, it’s time to meal plan. Meal planning will allow you to pair recipes together and will help cut down on wasted produce. One of our favorite pairings is grilled garlic scapes and veggie burgers! Had it not been for the CSA, I never would have known about garlic scapes. In addition to creating delicious meals, meal planning will help with grocery shopping. 4. Shop for Extra Ingredients. With your bag contents, recipes, and meal planning all done, you can easily shop for the extra ingredients you may need. If you know you’re getting Swiss chard, why not make a Swiss chard quiche? Just make sure you have an onion, some milk, cheese, and eggs on hand and it’s a simple, delicious recipe. When to wait to grocery shop: Sometimes it’s better to wait until you receive your bag before you head to the grocery just in case something’s different than what you were planning. Waiting can be necessary when you don’t know what’s in your bag (see #1). Having a game plan when you first start going to the farmers market will eliminate a lot of guesswork. It will help you figure out what to do with your caraflex cabbage, introduce you to new fruits and vegetables, and make your summer dining a lot more enjoyable. What’s one of the stranger produce items you’ve purchased at a farmers market? 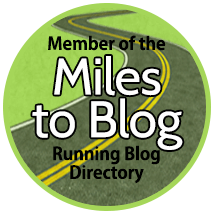 Linking up with Confessions of a Mother Runner and The Fit Foodie Mama for Meatless Monday. I highly recommend doing a CSA. It’s super fun and it forces you to eat out of your comfort zone! I would love to do a farm share. Every year I say I’m going to look into it and then I never do, lol. thanks for all of these tips! You totally should! They’re such an adventure! Plus local and fresh produce. Can’t go wrong with that! I’ve never been to a farmer’s market but down here we have a “U-pick” farm where you go pick your own veggies in the fields. I love pickled cucumbers! Ive never done a farm share but I think it sounds great. Im sure planning ahead with a meal plan would be really helpful! I love Farmer’s Market season and the start of our CSA. It’s fun to experiment with new vegetables. Very cool! We don’t get a farm share or CSA mostly because I AM a bit intimidated by it. These are some great tips to make it a little less scary! I would love to have a CSA – I wish my husband were more willing to eat more veggies! These are great tips. My husband and I just had this convo yesterday–not that we do a CSA, but he saw a truck pull up to my neighbor’s house yesterday full of coolers and he was so intrigued! For me, the downside would be the unpredictability of what we would be getting. I’m such a planner! I am, too. But it’s super fun to see what you get. And it really forces you to try new recipes. I swear half the stuff I make now I never would have made in a million years before. One of the reasons why I stopped getting my farm share was because I didn’t meal plan – it really is key! It really is. So much wasted produce without planning. Especially with kids! I’ve yet to do a CSA but would love to! We have a weekly farmers market near my work so I get our veggies and local foods there – which I love! That’s just as good as the CSA in my opinion! I had the best intentions of using up everything this week but we ran out of time. Now I’m siphoning off veggies to my aunt and neighbors! We have a local Farmer’s market but I am always in a hurry and never have time to stop. I love Brussel sprouts and apples. I used to loathe Brussel sprouts. But now I love them! I’ve been meaning to be better about shopping at the local farmers markets, but somehow always wind up not following through on that. Hopefully I will be better about it this summer. Ah, you should! So much fun stuff to try. I love the idea of a farm share, but I’ve never done it. I have a lot of picky eaters here plus we travel a lot during the summer. I love the idea of trying new things each week though. We have picky eaters, too. I refuse to cave! Okay, sometimes I do. But I usually can con them into at least trying whatever it is the adults are eating. Shopping for produce is already intimidating for me. I like bountiful baskets because even though I don’t know what I’ll get until I pick it up, at least the choices are made for me. Lol. Then I just need to figure out how to use it. I haven’t done a CSA yet but I’ve been wanting to for a long time! Thank you for these good tips. I live in NC and we have so many great farmer’s markets and fresh options! That’s awesome. Nothing better than fresh produce!